Ok, I will restart today. I'm notorious for never restarting the laptop until I am forced. I have way too many windows and tabs open, too much work that is In Progress. So the other day when I got nagged by Windows to do a windows update and a restart, I got curious about how long it has been since the last time I actually closed everything and started the laptop. 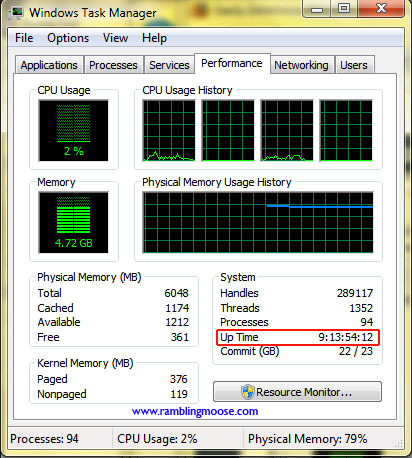 This is called "Uptime" in the Business. 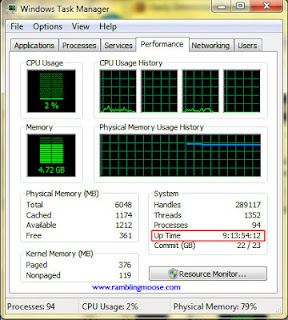 It means how long did the computer think it had been up. Since I simply hibernate the computer because it's much easier for me to get back to what I was doing, this isn't completely accurate. This laptop is up about 14 hours a day every day. Uptime is reported here as being 9 Days, 13 hours, 54 minutes and counting. Hold the Ctrl, Shift, and Esc buttons at the same time. The window that comes up is your Task Manager. Read Up Time on the window. It is highlighted it on the picture in red. 9 days, 14 hours now.... I think I need a vacation. That would be back in May.